1When Arcadia was established in 2001, Lisbet Rausing was concerned to use its resources to protect and advance knowledge and to establish the means of preserving that knowledge. That aim was based on an appreciation of the importance of academic and professional expertise. But the essence of the fund’s purposes was the preservation and enlargement of cultural information and awareness in their broadest senses. 2These aims were initially embodied in the Endangered Languages Documentation Programme, which reflected the growing awareness of the threat to a core aspect of human culture. It was designed to support projects to record the nature, structure and use of as many of the world’s languages that are threatened by extinction as possible. It exemplified a combination of an overarching central initiative and a responsiveness to approaches and applications by well-qualified experts. 3As the Endangered Languages Documentation Programme was being launched, attention turned to a parallel need to act on behalf of a field of knowledge and culture that was also under threat. Historical archives — the essential records of human activity — are subject to the ravages of time, to neglect, to forgetfulness, and to the destructive forces of war and civil unrest. In response to this danger, Arcadia established the Endangered Archives Programme (EAP) to ensure that archival material was not only preserved, digitally recorded and retained in its original location where possible, but also safely deposited in more than one location. It embodied a major effort to ensure that knowledge of the past — of human social life in its huge variety — would remain available to the future. 4The aims and means of the EAP — its “model” — followed logically on those of the Endangered Languages Documentation Programme. Both were concerned to rescue or maintain culturally significant records. Both focused on a large-scale effort to protect important fields of knowledge. But both were designed to attract individual proposals within those fields rather than depend on direct, detailed initiatives by Arcadia. It followed that both of them respected, and were designed to harness, the efforts and initiatives of a multitude of scholars. 5As with the Endangered Languages Documentation Programme, the EAP depended on a panel of international experts to allocate grants to individual scholars and an institution, in this case the British Library, to administer those grants. Given its role and the nature of the EAP, the panel had to be international, experienced and representative of interests and archival knowledge. By the same token, its was composed of historians and archivists of standing, reputation and influence. 6Initially, and given the flow of applications for support at an unusually generous and enlightened level, it might have been assumed that the panel’s work would be undertaken straightforwardly within the original parameters of the EAP. It was anticipated that grants would be fairly scrupulously confined to funding the digital recording (and the deposit of those recordings) of archival material (historical written data, photographs and sound recordings) largely derived from pre-industrial societies. Indeed, at the initial stage it was not envisaged that support would be offered to applications concerned with more unconventional archives or the physical preservation/restoration of material generated by advanced societies. 7However, as knowledge of the programme spread, applications became more diverse — and in some respects unexpectedly and commendably adventurous. First, panel discussions increasingly focused on the fact that the boundaries between categories of archives are porous and the distinctions sometimes difficult to maintain. At the same time, the EAP came to acknowledge the urgency of the threat to archives that appeared to be outside the original expectations but were no less significant for historical research and the preservation of cultural knowledge. 8Quite early on in the history of the EAP, therefore, the panel had to consider proposals to preserve seemingly unconventional material — material concerned with Italian folk songs, for example, or Iranian radio broadcasts between the two world wars, or Chinese tax records. Whatever doubts were entertained were resolved by the quality and intrinsic interest of the data — which sometimes persuaded an initially sceptical panel. By the same token, some unusually significant archival records from relatively modern periods and developed societies also seemed sufficiently important to overcome a strict interpretation of the programme’s original criteria. In effect, the EAP was drawn into a very broad-based appreciation of the worthwhile diversity and multitudinous character of archival records — and the importance of ensuring their survival. 9Initially, it was not envisaged that the EAP would support focused work on the physical preservation of material. But it was not always easy to maintain the distinction between preserving by sustaining and copying, and preserving by protecting archives through the acquisition of storage materials and other means of physical maintenance of archives. This was comparable to the fact that the Endangered Languages Documentation Programme, while primarily focusing on the recording of endangered languages, did have an influence on the preservation or extension of their use, even though that was not specified as a direct objective of the scheme. 10It is also worth emphasising that the EAP arrived at these extensions or variants of the original guidelines through the detailed consideration of a wealth of empirical situations. That is, the panel learned more about archival issues precisely because it had to consider a wider and deeper range of such concerns than its members’ individual experiences may have brought to their attention before the panel was formed. Applicants as well as decision-makers determined the shape and evolution of the programme. 11And this is an example of the important fact that in the last resort, it is less the work of the panel than the scholarly efforts and huge commitments of those who were supported by the EAP that will loom large in its preservation of, and therefore contribution to, social and cultural knowledge. This volume offers a relatively small but significant sample of the fruits of all those endeavours, ensuring that the past will be illuminated and that darkness will not obscure history. SUPPLE, Barry. 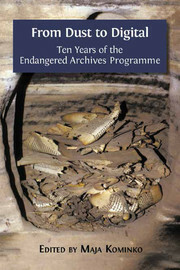 Preserving the past: creating the Endangered Archives Programme In : From Dust to Digital : Ten Years of the Endangered Archives Programme [en ligne]. Cambridge : Open Book Publishers, 2015 (généré le 21 avril 2019). Disponible sur Internet : <http://books.openedition.org/obp/2211?nomobile=1>. ISBN : 9782821876262. Supple, Barry. “Preserving the past: creating the Endangered Archives Programme”. Kominko, Maja. From Dust to Digital : Ten Years of the Endangered Archives Programme. Cambridge : Open Book Publishers, 2015. (pp. XXXIX-XLI) Web. <http://books.openedition.org/obp/2211?nomobile=1>.